Where to find good Vietnamese food in Singapore - PhoStreet! When it comes to good Vietnamese food in Singapore, only a handful comes into my mind. There are A LOT of Vietnamese restaurants selling just pho. 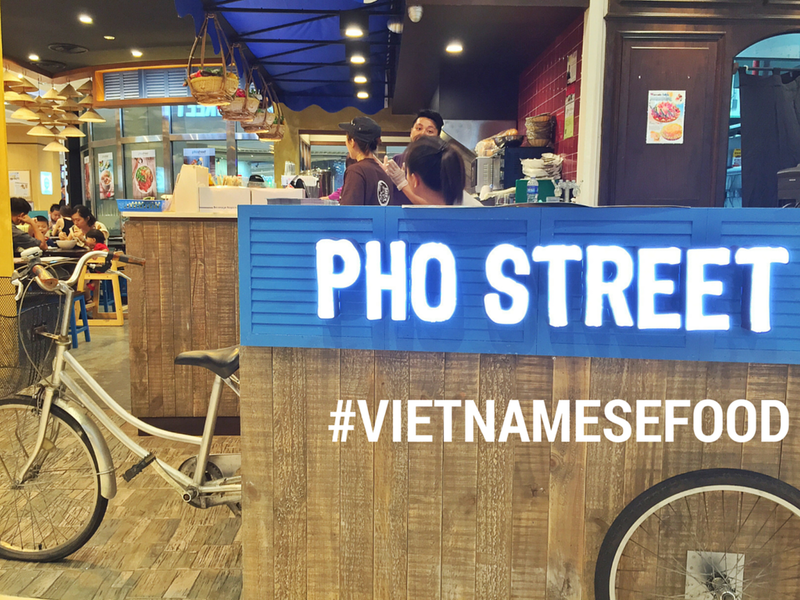 However, at Pho street, the newly revamped menu, designed by a young chef hailing from Vietnam, has a lot more traditional fares from Vietnam to offer. "Evilbean! Are we playing spot the difference? The 2 images are the same what!" Um, yeah. They look almost the same, but they are actually 2 different drinks! The lemon cooler has a slightly stronger taste due to the lemon and peppermint, while the passionfruit and basil mojito is lighter in taste, which is the perfect accompaniment for your mains. The snack platter comes with: 2 pcs of Crispy Fried Pork rolls, 2 pcs of Roasted Chicken Skewers and 2 pcs of Vietnamese Crabcakes. All of them were really well done: fried to crispiness, yet not oily. The chilli dips that came along with this platter whets up your appetite for more food with their tangy spiciness with that hint of lime. And THE PLATING IS ON A WOODEN STRAW-HAT-LOOKING THING. Too cute! Look at the translucency of these fresh summer rolls - if only complicated humans are as transparent as these. Just like its name, these rolls make you feel as if summer is in your mouth with the generous stuffing of greens and herbs. The savoury flavour of the pork belly and prawn, combined with the thick and sweet sauce that is topped with peanuts, makes this snack very refreshing. All you hear is crunch, crunch, crunch, with this crispy fried chicken mid-wings. The batter itself is peppery and can be a little spicy for those who cannot take spicy food. However, the genius chef that came out with this dish serves it with this caramalised sweet dip, which gives the wings a sweet flavour with spicy undertones. A MUST ORDER! I gasped like a suaku when I saw this dish served to me. Rarely seen in Singapore, I was told that this is bánh tráng mè, a snack unique to Vietnam, and is considered a novelty even to the locals in Vietnam. Specially imported from the country of origin, these Sesame Rice Crackers can be eaten on its own, or you can eat these by pairing it with the minced meat. The minced meat is marinated nicely with spices, and the combination of the slightly salty minced meat and the slightly sweet rice crackers is just wonderful. I am not really a fan of pho, but I love beef. And the pho at pho street is generously loaded with beef balls, beef slices, beef shank, beef tendons and beef tripe (stomach). You could almost find a cow swimming in this bowl of pho. The beef balls were too soft for my liking. I prefer my balls to be firmer with a chewy texture. These just crumbles apart with a single bite. I have heard rave reviews for their pho, but this wasn't really my cup of pho. THIS WAS MY FAVOURITE DISH! I liked how colourful this bowl of dry rice vermicelli was. Not only was this pretty to the eyes, the flavours were also flamboyant on your tongue. Sweet, spicy and tangy, this vermicelli will definitely brighten up your day with its colours and flavours. 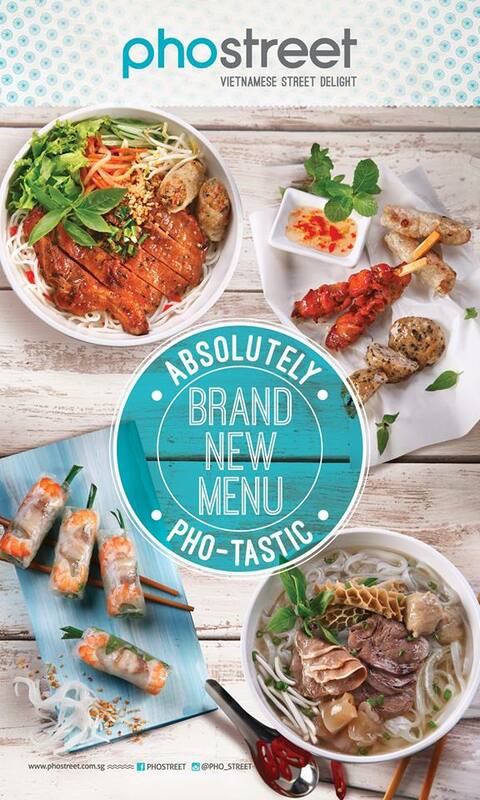 DO ORDER THIS the next time you drop by Pho Street! Thank you Pho Street for the invite! Omg I have to go try it! Thank you so much for letting me know!